I’m feeling the weight, the heaviness of these tragedies, along with the pain of several friends with chronic illness, some who’ve lost of parents, and the threats of cancer. Grief and pain often happen in waves that wash over us, and we need help and time to process it. In church or on our own, we often do not allow ourselves to really grieve the loss of a job, a dream, a relationship, a loved one, but rather feel like we need to trudge on or put on our Christian happy face. It’s important that we create opportunities and give ourselves and our communities person to feel their pain and grieve their losses. 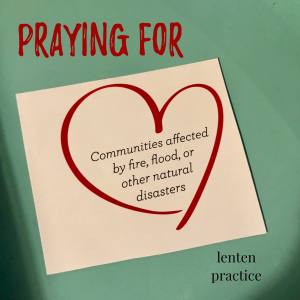 It’s ok to lament and not just celebrate together when we come together for worship. 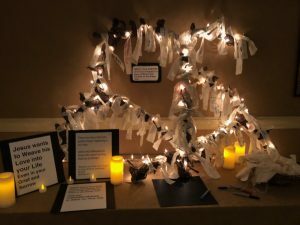 I designed a prayer station this past year for the National Youth Workers Convention to allow youth workers to grieve. 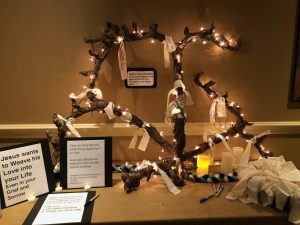 I reimagined the station again in February for the students at the United Methodist conference called Warmth in Winter. The pain and loss that were recorded on the muslin strips were intense. You might use this station with your church community or small group this week or in the future. It can be used as a corporate response. 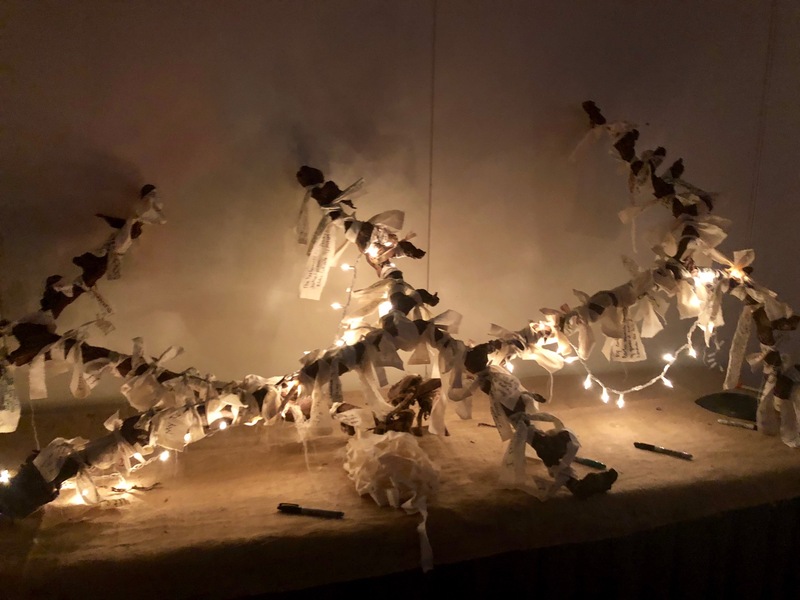 You can pass around the pieces of muslin and pens and have everyone respond together and then bring up their grief prayer and put them on to the grapevine or on a cross as they come up for communion. Or you can set up the station or multiple stations around the worship space to be used after the sermon or following communion. You could use this station as a part of your Holy Week services too. 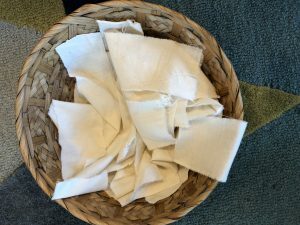 Supplies:For this prayer station you will need strips of muslin, enough for everyone in your group. approx. 12 inches x 3 inches but they can be thinner. Action: Participants will consider what they are grieving, what pain they are feeling and write this on a pice of muslin. 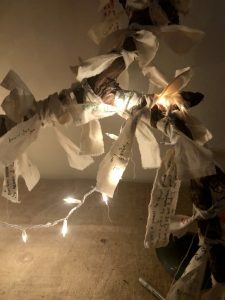 Then they will tie the muslin on to a grape vine garland or to a cross and give the pain to Jesus, the true vine. There are many hard and painful things happening in our lives. Jesus says Blessed are those who mourn for they shall be comforted. If you want more information on how you can respond to the needs in Africa after the cyclone, this article from the NY Times has several links. Help the flood victims in the midwest here. Two of my friends have written amazing books to help us grieve. freerangeworship.com prayerhearts from 40DAYS toward Love found in store.